How to arrest attention (pun intended) using social media. This is a complaint I hear often: We put a ton of time into social media and it’s like nobody is listening. And then they blame the algorithm. Psst. It’s not the algorithm. It’s YOU. Because the way most brands do social media, nobody IS listening. Most businesses – at least in my industry, which is travel, tourism, and hospitality – do their scheduled, obligatory posts like clockwork… often carefully vetted in advance by executives who crave control over all marketing messages. That’s the key issue right there: the forum of social media rewards nimble and impromptu risk takers, and penalizes scripted, safe automatons. And I don’t mean the algorithms reward and penalize…I mean the audiences. Algorithms do indeed shape who sees your stuff…but algorithms are influenced by audiences. If enough folks engage with your stuff, the algorithm rewards you handsomely. And if you spend just 10 minutes scrolling through their Twitter feed, you’ll be rolling on the floor howling with laughter. And then you might even click “follow,” despite the fact that you live nowhere near Kansas. I did. The population of Lawrence is around 95,000. 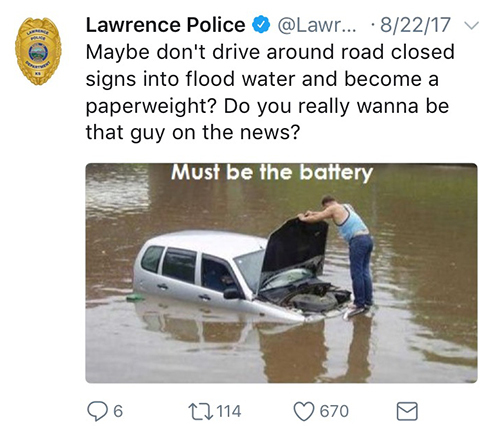 The Lawrence Police Department has a Twitter following of 63,000. If the New York City Police Department wanted to have the same ratio of followers-to-population, it would need 5,610,000 followers. It currently has 431,000. And engagement with LKPD tweets is absurdly high…a recent tweet got 550,000 likes and 174,000 retweets. Reading that will make lots of social media marketers swoon with envy. It’s not just an obligatory marketing tactic…it’s used as a tool and grounded in solid purpose (connect with the community and make them want to listen to the police). That North Star anchors their entire effort, so it never loses its way and becomes white noise. It’s an ongoing dialogue, happening in real time. Even promotional messages feel natural and organic…not scripted and salesy. They promote the bejesus out of their social channels every chance they get, even offline (see t-shirts above for living proof). It’s entertaining (and therefore shareworthy). Say what you will about human attention spans, but the fact is…we gravitate toward things that make us laugh and feel good. The bottom line is…they invest the time AND the risk AND the focus. Social media – when done right – requires diving into the deep end fully clothed. So, you may be spending a lot of time “doing” social media, but how exactly are you spending that time? If you spend more time planning than actually engaging with audiences, flipflop that ratio and you’ll see a difference. Or, you could just give it all up and become a Lawrence Kansas police officer. It seems fun.